On December 6, 1991, she gave birth prematurely to twins, 3 months before their due date. One of the twins died while the nurses struggled to keep the other alive. I meet Toyin Saraki in the restaurant at Radisson Blu Hotel, Kigali. Ambient music seeps from the ceiling speakers into my ears. The air is calm and cool, a distinct contrast to the buzz and heat outside the adjoining Kigali Convention Centre where several activities are taking place for the Africa Health Agenda International Conference. Mrs Saraki’s charisma matches the warm, yellow glow of the lights in the room. Her voice is mellifluous, coming out in near-whispers. I introduce myself and take a seat across the table to begin our conversation. We are flanked by two members of her team and a PR friend I’d just made at the convention who helped set up the meeting. Earlier in the day, Mrs Saraki was on a panel with Sarah Opendi, Uganda's State Minister for Health, discussing social accountability for Universal Health Coverage, a main topic of the conference. One of the most pressing topics of discussion was how much of the world’s health problems happened in Africa (24%) while only 3% of all the health workers in the world were African. 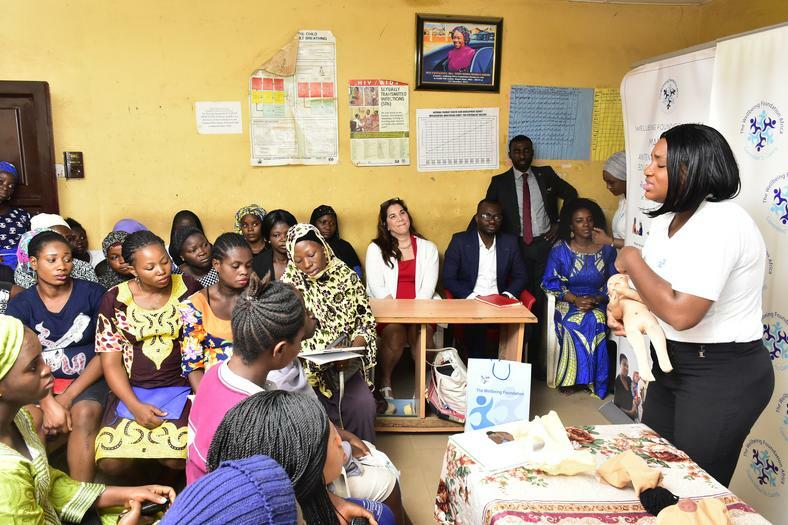 Mrs Saraki’s foundation, the Wellbeing Foundation Africa, is helping solve this problem, particularly through a programme that hires and trains only local midwives. Within the 24 hours between December 6 and 7, 1991, she gave birth prematurely to twins, 3 months before their due date. One of the twins died while the nurses struggled to keep the other alive. Still, within those 24 hours, she got married. The experience inspired her to make a promise to God that she would help as many women as she could who do not have access to the kind of network and resources that she did. Thus, her career as an activist -- an Unlikely Activist, as she calls herself -- began. “I think if the Wellbeing Foundation Africa has done something, it has brought reproductive health onto the front burner of issues in Nigeria, and quite rightly so because Nigeria is one of the highest contributors to maternal death worldwide,” she says about the foundation she started in 2004. Nigeria has the 4th highest maternal mortality rate in the world but is projected to become number one by 2021, according to the World Bank. Currently, Finland, Greece, Poland, and Iceland, have the lowest maternal mortality rates in the world (3), according to World Bank data. All the other three countries with worse figures than Nigeria are still African -- Sierra Leone, the Central African Republic, and Chad. Just below Nigeria on the list are South Sudan, Somalia, and Liberia in that order. Mrs Saraki tells me that the first 10 years of the foundation’s work focused primarily on trying to convince policymakers and governments to do the right thing by pregnant women and their newborns. However, everything changed when she became the global goodwill ambassador for the International Confederation of Midwives, she says. That’s when she saw more closely the kind of work midwives were doing with women. The new insight motivated the foundation to start Mamacare, an initiative designed to inform and take care of expecting mothers and their babies after they’re born. “The midwifery-lead Mamacare classes, first of all, seemed to increase hospital attendance of women in the surrounding communities, to the extent that even the medical directors of the hospitals were telling our midwives that the only day antenatal is full is when the Wellbeing Foundation Mamacare midwives are around,” she says. At this point in our conversation, her tone becomes sombre. “A couple of days ago,” she says, “I was looking at old pictures with my team and there was this particular group picture from a programme I used to run in 2004. It was called ‘Twins and Multiple Births Assistance, I've stopped it now. But back then, having multiple births put you at high risk of dying. Left to the government, the future does not look bright for Nigeria and maternal mortality rates. Nigeria’s health allocation has been consistently less than 5% of its total budget in the last 3 years. And even that percentage is for basic healthcare provision. Access to clean water is still a big problem for several hospitals, contributing directly to poor hygiene and sanitation. Water, sanitation and hygiene (WASH) coverage in healthcare facilities in Nigeria is only 22%. So, if the first drink of water a baby has is likely from an unclean source, what then are the babies chances of surviving and living a full, healthy life? As with most problems in Nigeria, the solution lies in the hands of private and non-profit organisations like Mrs Saraki’s. And she believes that with the help of global partners, as has been proven thus far, these problems are not insurmountable.